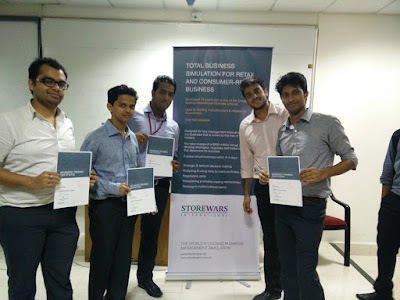 Storewars is an international, dynamic, live action total business simulation, where participants take charge of a $600m virtual FMCG company and by developing strategies, negotiating and making decisions to determine its success. It focuses mainly on the aspects of retailer-manufacturer interactions. The workshop is conducted throughout the globe touching more than 40 nations. 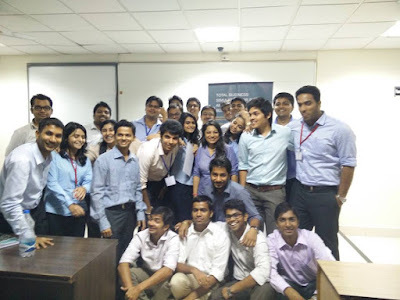 In India SIMSREE is the only B-school other than SP Jain where this workshop is conducted. The Store wars at SIMSREE, which was conducted on 23rd and 24th August began with a gush of anticipation, excitement and some cunning strategies based on the study material sent to the participants a couple of days before the event. Before we begun the workshop, the host – Prof. Umesh Dhand, explained the rules, the possible routes of winning and certain basics about the software which we were about use. After that, the participants were randomly divided into five different groups. Out of these, two groups of five each were the retailers and three groups of four each were the manufacturers. The role of the manufacturers was to make products considering all the costs and sells it to retailers negotiating on shelf space and promotional activities while the role of the retailers was to acquire products, sell shelf space and introduce and brand new products. The purpose of this was to make the management students understand the company operations from the top as well as to see the perspectives of the manufacturers, retailers as well as of the consumers. Since it was totally a risk free environment for us, it was a good test of the implementation and execution of our decisions. All the teams had an option to opt for reports coming from the market research giving them a market share of each product from the 2 segments - packaged food and detergents. The entire workshop consisted of 3 periods of 6 months each where inventory-management, market share, EVA, NOPAT, customer mind space were decisive factors determining the success of a company in a given period. In the end Manufacturing 1 and Retailer 2 were the winners in their respective categories after 2 exhaustive days of negotiations, brainstorming and strategies. It was a great experience for both the seniors and juniors - some got to revive their concepts while some got an understanding of retail sector negotiations. We thank the organizers of SIMSREE for providing us with hands on experience on this business development model via software simulation of international standards.